The most curious of the Chardonnay supporters came from a neighbor who happened upon the Virginia Wine Lover Magazine at a local wine shop. I was introduced to her opinion on Chardonnay while walking my dogs when she announced from the other side of the street that ‘she had a bone to pick with me.’ I have a natural tendency to say or do things that draw the ire of people, especially neighbors, so I was pleasantly curious as to this particular bone to pick. Given some of the pro-Chardonnay feedback I received, I took the occasion of Virginia Wine Week last week to revisit the subject of Chardonnay. 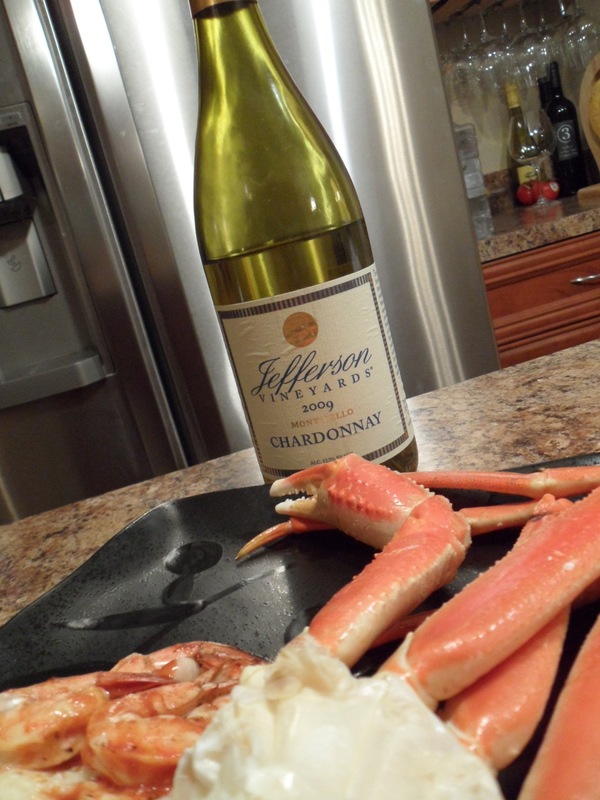 I opened five Virginia Chardonnay’s throughout the week – my two favorites of the bunch: Jefferson Vineyards 2009 Chardonnay and Chatham 2009 Steel Chardonnay. Jefferson 2009 Chardonnay: I tend to like Jefferson Vineyards’ entire lineup, but this Chardonnay is near the bottom. The first sniffs and sips were muted, which I attributed to being too cold. Pleasant apple, stone, and lemon aromas were revealed as the wine warmed. I picked up the same apple and stone flavors in the mouth with reasonable acidity. The crab leg pairing made this wine better. Although I did enjoy this wine with dinner, this one didn’t wow me. 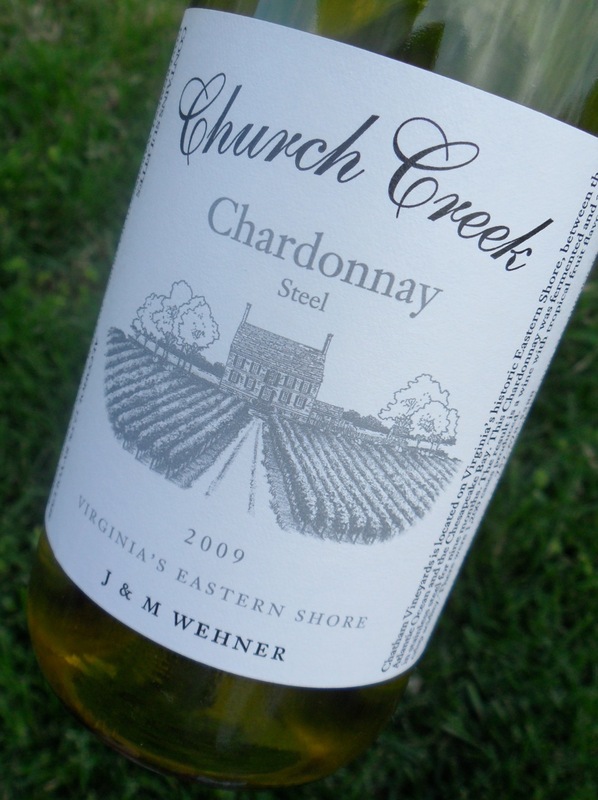 Chatham Vineyards 2008 Steel Chardonnay: I’ve had more Chatham Chardonnay than any other, Virginia or otherwise. Our family spends a lot of time on Virginia’s Eastern Shore during the summer months, and Chatham is the closest respite from an overcrowded family cottage. Since there is an abundance of fresh-caught Chesapeake Bay seafood available in the summer, I tend to pair Chatham Chardonnay’s with crab cakes or local mussels and always enjoy the pairing. Light gold in the glass, I get pungent lemon and grapefruit aromas with hints of tropical fruits on the edges that keep the lemon contained. In the mouth, lemon sweetarts dominate. In looking back at my old tasting notes, I seemed to enjoy this wine much more during the summer months. Time and place do matter. I rarely, if ever, make a call for comments, but I am very curious to hear from Chardonnay fans with their ‘must try’ bottle, and from Virginia wine enthusiasts with their favorite Virginia Chardonnay. Take a couple of minutes to post a comment, please. Up next in my in ‘Finding My Chardonnay Palate’ experiment is a high-end (code word: perhaps overpriced) California Chardonnay tasting with a couple friends. I’m brining the Ramey Chardonnay that was gifted to me by my mother-in-law last year. So, unfortunately, Chardonnay and Virginia just don’t make a winning combo for me. I’ll be interested to hear how your California tasting went. I’m a fan fan of Mer Soleil’s Silver, which is a slightly pricey unoaked Chard. Otherwise, I mostly stick with a French Chablis when it comes to this grape…and there are some good ones out there. Thanks for stopping by to comment. In general, I am not a fan of Virginia Chardonnay – there are just too many other excellent Virginia wines out there to drink Chardonnay. There are of course a few exceptions. I’ll have to check out the Mer Soleil’s Silver. Cheers! I think you might like more if you let them age perhaps? Just wondering what you don’t like about the wine. Hi Andy – thanks for stopping by to comment. It’s a deal on the Chard trick. Some of my distaste may be mental… I just can’t seem to fully enjoy a Chardonnay (Virginia or otherwise) when there are other whites that I really dig – namely Viognier, Sauv Blanc, Albarino and sparkling wine of course. Which brings me to a good point – when is Jefferson going to make a sparkling wine? I’ll see you at the barrel tasting! Hi Theresa: Thanks for your comment. You raise a great question about what Chardonnay would make a nice gift. I may be the wrong person to ask since I tend to go with other varietals when drinking whites. In terms of Virginia Chardonnays, I would go with the Jefferson Vineyards Reserve Chardonnay or one of the Chardonnays from Linden. I hope this helps somewhat. Cheers!